On a distant colonial outpost of Earth, a group of terraformers is under threat from the planet’s most fearsome predator: the giant carnivorous Farakosh. All that stands between the colonists and a grisly death are the Exotrons – huge robots equipped with devastating firepower, designed by the outpost’s leader, Major Taylor. The writer for the acclaimed stories Arrangements for War and Thicker Than Water returns to Big Finish. However, this story doesn’t live up to Paul Sutton’s previous output. 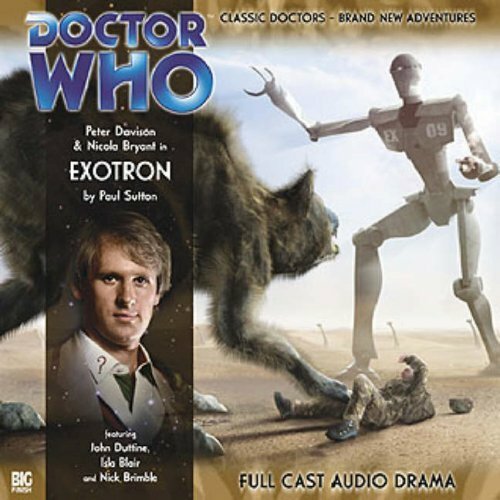 Exotron is another three-part story from Big Finish, and the compressed run time serves to exacerbate one of the serial’s main flaw; everything is rushed and very little is developed. The two central plot lines; Peri’s attempt to first survive, and then communicate with the Farakosh, and the Doctor’s attempts to figure out the horrible secret behind the Exotron and how it ties into his psychic abilities. There are plenty of little narrative threads running through Exotron as well, such as the imminent arrival of an Earth authority who’s interested in both the Exotrons and a little bit of mayhem, a love triangle between three characters (the creator of the Exotron, Major Taylor as played by John Duttine, head scientist Paula Taylor portrayed by Isla Blair of The King’s Demons fame, and the recently dead Christian played by Richard Earl), and an attempt to deduce why the Farakosh are so hostile. All these threads get “air time,” but the rushed nature not only leads to unsatisfying resolutions to all of them (and to Exotron as a whole), but everything about them just feels incredibly cliched. The revelation of what powers the Exotrons is interesting, but it’s been done before, and knowing the interactions of several characters, the power source of the Exotrons doesn’t come as any sort of surprise, as well as why the Farakosh are so hostile to the incoming colonists. The biggest cliché comes from the “out of nowhere” bad guy Ballentyne (Nick Brimble, who also plays the technician Shreeni), who arrives near the end of the the second episode to shoot things and blow up buildings in the third episode before sliding away with nothing more than a “he’ll get what he deserves” from the Doctor. There’s just nothing that stands out and makes Exotron unique. Exotron is the second main range story featuring the Doctor and Peri (the previous one was release SEVEN years prior, Red Dawn, while all their other stories have been along side the Egyptian princess Erimem), and while I hate to call a companion’s part in a story superfulous, Nicola Bryant really didn’t bring much to the party other than to be put in trouble, engage in some banter with the Doctor both verbally and mentally, and provide a suggestion that since insects communicate through vibrations. Aside from the opening (where for a brief shining moment I hoped that Peri’s often mentioned botany experience might finally come into play), Peri’s part could have been played by one of Exotron’s secondary characters. Peter Davison does a fine job, playing the sacrificing and noble Fifth Doctor as well as he ever has. His banter with Peri is top notch, as well as both his anger as Major Taylor’s experiments and his willingness to do whatever is takes to help those who have been hurt by the Exotron program. But that’s really all that I can say about Davison’s performance – it was “fine,” nothing outstanding, nothing detrimental. Urban Myths is the one-part story that accompanies Exotron, and it also was a story where the short run time hurt the overall result. Three Time Lords from the Celestial Intervention Agency sit in a restaurant, plotting the death of the Doctor for his part in the destruction of an inhabited planet. 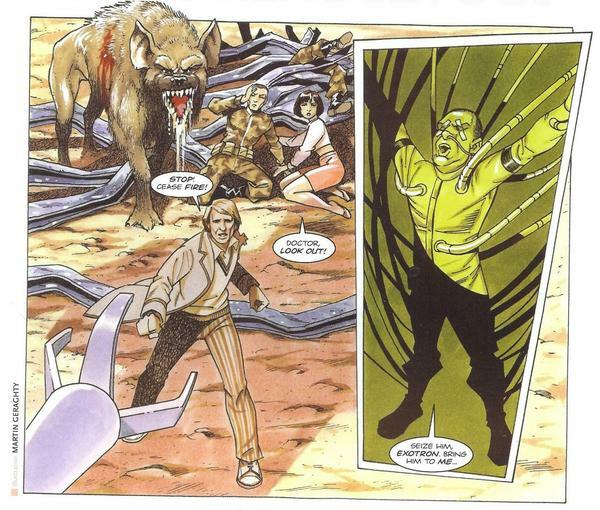 Each Time Lord tells the story in a different way, which gives Davison and Bryant a chance to play the Doctor and Peri in new ways; in one story, they’re madmen laughing at how casually the planets dies at their hands, while in another version they’re both travelers who would rather let a planet die instead of getting their hands dirty trying to save it. It’s a fine little distraction of a story which could have used a few more minutes to perhaps expand on each individual story and color the three Time Lords beyond stuffy CIA stereotypes. Exotron is a “ok” story at best. There’s nothing about it that drags the story down to an unlistenable level, but there’s nothing that also makes it stands out above any other Big Finish production, to the point that there’s really nothing quasi-clever I can think of to end this review. Cobi’s synopsis – Exotron is an adequate audio – there’s nothing that really stands out to make it special, but there’s also nothing that would see it tossed in the rubbish bin. Sylvester McCoy is the Doctor in…Valhalla. This entry was posted in Big Finish Review and tagged Big Finish, Big Finish Audio, Big Finish Review, Doctor Who, Doctor Who Audio, Doctor Who Review, Fifth Doctor, Nicola Bryant, Peri Brown, Peter Davison, TARDIS. Bookmark the permalink. I remember as a kid I had three Doctor Who “Choose Your Own Adventure” style books (sadly now lost in my parents’ divorce). And I remember marking out (yet not knowing why exactly) that one of the books made use of Peri’s botany skills.